In the early days the cannon used in war by the British Army were manned by men employed by the Board of Ordnance and not soldiers. The artillery was stored in the Tower of London as had all weapons and military stores since 1455. 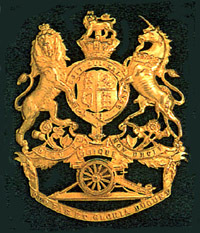 Charles II carefully organised the Board of Ordnance from which are descended the RA, RE, RASC, RAOC (now the Royal Logistic Corps since 1993) and REME. There were up to 100 gunners on the permanent staff but the Master of Ordnance would take on men to move and fire the cannon when war broke out and disband them when hostilities ceased. By order of a Royal Warrant dated 26th May 1716, two companies of artillery were formed at Woolwich. Each company consisted of 5 officers, 9 NCOs, 30 gunners and 50 matrosses. The duty of a matross was to assist the gunners in traversing, sponging, loading and firing the guns. The regiment with 66 guns, first saw action in the expedition to Spain. They had trained well because the citadel of Vigo was captured in two days. 200 enemy guns were taken or destroyed and the booty was worth '84,000. In 1757 the regiment was increased to two battalions of 12 companies each. They served in a mixed force under Prince Ferdinand of Brunswick and earned the reputation of having the 'cleanest' guns. At the battle of Minden, guns were taken into action at the gallop for the first time. At the famous siege of Gibraltar by the French and Spaniards the artillery were kept constantly busy for over three and a half years from 1779 to 1783, night and day. Enemy vessels blockading the port were fired on using red-hot shot, iron cannonballs heated in an oven, to set fire to them. They were well stocked because, by the end of the siege it was reckoned that 8000 barrels of powder and 200,000 cannonballs had been used. The distribution of artillery in the Allied Army was; I Corps: 64 guns, II Corps: 40 guns. The Cavalry Corps had 30 guns of Horse Artillery. It was the last battle where conventional artillery was used. The Horse Artillery saved the day while the less mobile guns proved less effective. During the afternoon when French cavalry were sent in wave after wave against the British infantry squares, the artillery was ordered to shelter inside the squares until it was safe enough to return to their guns. The Duke of Wellington wrote after the battle that he was "not very well pleased with the artillery" because he saw some of them leave the field entirely taking limbers and ammunition. But this was unfair because there were many acts of great heroism by both gunners and officers. On the whole, apart from the galloper guns, artillery was of more use in a siege situation than a battle. The recoil of a gun shifted it's position so much that it had to be re-aimed every time. It wasn't until the development of the French 75mm gun in the 1890s that artillery fire could be accurate in a battle situation. At the end of the 19th century The Royal Artillery was divided into Garrison and Field Artillery. The Royal Field Artillery was then divided into: Horse batteries, Field batteries and Mountain batteries. The Royal Horse Artillery is dealt with under a seperate section. The field batteries were numbered 1-103 and had their depot at Woolwich. A battery was commanded by a major with a captain as 2nd in command. It was divided into 2 or 3 sections each commanded by a lieutenant and consisting of a detachment of two guns. The field batteries were stationed around Britain, 2 or 3 being garrisoned together under a lieutenant-colonel. In a war situation 3 batteries would form a brigade division and added to an infantry division. There were ten Mountain batteries (numbered 1-10) and they served in India. Their uniform was the same as that of the Field Artillery except for their lace boots and gaiters which were brown instead of black. The Garrison Artillery was composed of104 service companies in 1900, forty of them in the UK, 37 in various colonies of the Empire and 27 in India. A company was commanded by a major with 6 or so officers, aroud 10 NCOs and 100 to 200 men. The regiment has been represented at so many battles that in about 1830 it was decided to award the honour of Ubique to cover them all. Some batteries have individual honour titles, like 19 Battery (Gibraltar 1779-83). Officers: MS(AODO), London Rd, Stanmore, Middlesex. Othr Ranks: RA Manning and Records Office, Imphal Barracks, York.